Since sprouting up during the Bloomberg administration, new pedestrian -friendly public plazas have served as urban pit stops, places where time pressed New Yorkers can people-watch, grab a bite and have some down time before heading back to school, work, or a rigorous day of shopping. But this NYC Department of Transportation Plaza Program is important in other ways. These plazas have lured new businesses, increased sales in existing shops, slowed down traffic and decreased accidents in the surrounding areas. Today the DeBlasio administration’s Vision Zero initiative –a plan to lower speeding and reduce traffic fatalities to zero means that “placemaking” the buzzword used by urban planners to describe the implementation of new public spaces—is here to stay. Currently, Tribeca’s Finn Square is a candidate for redesign and on June 14, from 10am to 5pm, “Plaza for a Day”, sponsored by Tribeca Trust, and approved by the DOT will show you the possibilities. 16,000 square feet bordered by Leonard and Franklin Streets on the north and south and Varick Street on the east –will be transformed into a public square, with rotating art, street musicians, choice food trucks, free dance and yoga classes for kids (with parents), as well as an operatic performance. Bring your own musical instruments too. Everyone is invited to attend, and Tribeca Trust hopes to raise awareness for the need for a public plaza at this location, and attract community involvement and donors. 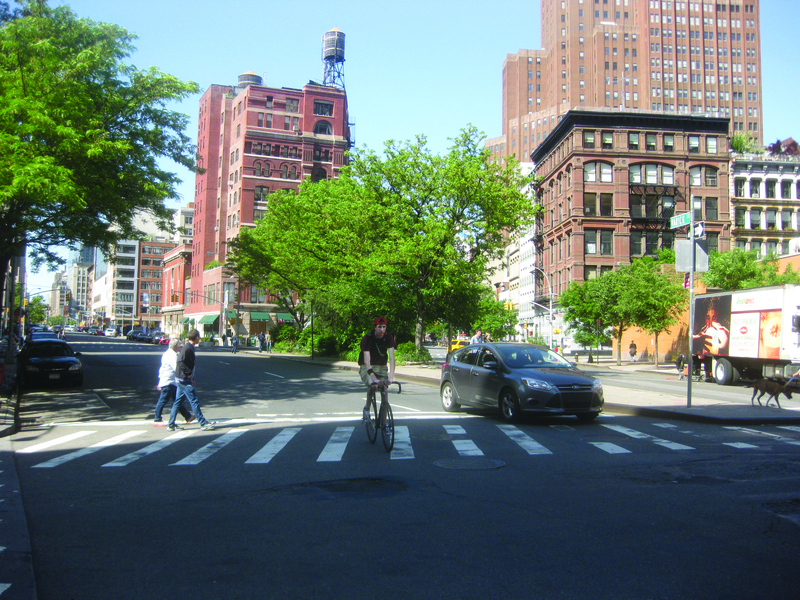 You can see plans for the Varick Street redesign and traffic will be rerouted to West Broadway. Patricia Wadsley is a freelance writer and a Tribeca resident.